I know that letterhead is pretty much a thing of the past...with the digital age, "letters" have turned into emails and DM's. But let me tell you...some things from the past are gorgeous and, now that pretty much everything is online, they can really make your business stand out from the crowd. Think of the last time you ordered something online and had a personalized note inside from the seller; how cool was that?! For me, it not only reinforces their brand image and name in my head (which converts to dolla' dolla' bills for them when I re-order), but it makes me smile and leaves a lasting impression that I also share with my friends and family (free marketing via word of mouth). 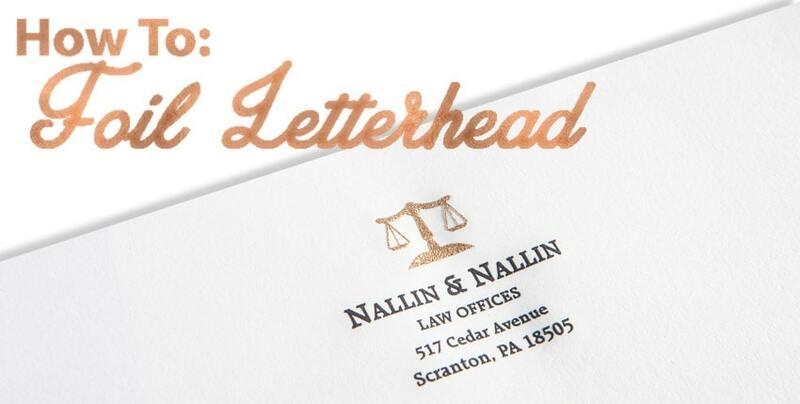 Or what about when you has any legal or tax work done...a shimmery gold letterhead can enhance the professionalism and add a touch of class and a look of elegance...it is way better than a plain basic printed sheet, that is for sure! So if the first thing you think of is "I can't afford the equipment to do it", think again...because a lasting impression is one of the few truly genuine things that can make your brand or business different from your competition. So instead get into the mindset of "how can I afford not to do it?". One of the simplest ways to make an impression on your customers is to include a hand written letter with your packages. And when that letter head is shimmery and stands out...even better. Perfect for an Etsy store owner to send a hand written letter to their customers that is included in the packages, or even to turn into a pad of paper and give as a gift or use internally, a properly foiled letterhead can make a huge impact. And that's why I wrote this guide for how to make DIY foil letterhead. • The Foil - Choose from different metallic colors, holographic patterns, iridescent designs, glitter bombs, and more! • The Pouch Laminator - This is the tool you will use to attach the foil to your paper. • The Printer - Any laser printer that uses dry toner (not a wax-based ink, like InkJet) should work fine. • The Pouch Carrier - This little envelope holds your foil to your page during the foil process, and protects your laminator. • The Letter Head - Design a gorgeous letter head...something that stands out from those basic word templates, and something that your customers will remember. Make sure to print it on a smooth paperstock (cadrstock thickness is fine, it just needs to be smooth) for the best foil adhesion. • Scissors - To cut foil off the roll. 1. Warm up your laminator. Depending on the pouch laminator you have, this usually just takes a few minutes. 2. While you wait, print and prepare your letterhead. Cut the foil to the proper size to fit the portion of your design that you want foiled. Place the foil with the colored side up and place a thin piece of scrap paper on top. If your foil overlaps your paper edge, place another thin piece of scrap paper below your sheet. Now place everything into the pouch carrier. 3. Once your laminator is warmed up, run your carrier through it just like you would a laminating pouch (with the sealed-end first). 4. Suppress your excitement for a moment and allow your carrier and foil to cool for a couple minutes. Once cooled, peel open the carrier, remove the scrap paper, and reveal your new gorgeous foiled letterhead, wahoo! 1. The Foil Isn't Sticking - This is the most frequently encountered problem, and it is almost always easy to resolve, so try not to stress when you peel off that carrier and see that the foil did not transfer. There could be several reason why the foil is not sticking, so let's start by going over this checklist to find the foil problem, and get you a solution. A. Are you using a dry-toner printer to print the design? Remember, our foil is backed with a special toner-adhesive that is actuated with heat and will only stick to dry toner. Wax-based inks (commonly used in InkJet printers) will not work. If you're not sure what your printer uses, you can check the user manual, or simply remove the ink cartridge and look online for information about that cartridge. B. Are you using a smooth paper stock? A textured paper will not allow the foil to reach into the cervices and stick, so can lead to an uneven foil. A smoother stock will give you a fuller and more solid look. C. Is your design too delicate? While it is possible to foil thin text and delicate fonts, it will work best with chunkier options where you can really see the foil in the finished piece. If you are using a more delicate script font, try adding a thicker "stroke" (outline) in your design to allow for a more solid grab. D. Is your laminator hot enough? A lot of crafty laminators have trouble reaching the necessary temperature to foil, which is at least 300* F. A hotter max temperature is recommended, but 300* is the lowest where we have seen success with foiling. If you are using a smaller laminator that cannot get this hot, try running the carrier through a 2nd time without peeling it open. The additional time and heat can still get a pretty decent foil for a lot of users. To ensure a perfect foil every time, though, we recommend a more professional pouch laminator instead. The most important features to consider are: (1) adjustable heat, (2) adjustable speed, (3) reaches a minimum of 300° F (149° C). E. Is your laminator too fast? On the same note as the heat, having the ability to slow down or speed up the lamination is a great feature to ensure a perfect foil transfer to your paper. If your heat is not adjustable, then you can achieve the same effect by simply slowing down the run speed instead (or vice versa). 2. The Foil is Wavy -- This happens when your laminator is too hot. Simply reduce the temperature or speed up the lamination if you have those adjustable settings. Questions or want to start foiling? Give us a shout at (866)537-2244 (866)537-2244 .